Artist and Craftsman Supply – 1660 S. La Cienega Blvd, Los Angeles, CA 90035 – Employee-owned arts and crafts store with drawing and painting supplies as well as printmaking, moldmaking, and tools. C & H Surplus (map) 805 Highland Ave, Duarte, CA ‎(626) 256-7907 ‎ Surplus Electronics. Used to be on East Colorado in Pasadena. Culver City Industrial Hardware (map) Hardware store near Crash Space with small parts and fasteners. Discount Bearing Co (map) (address and contact info) – Open Mon-Sat. Saturdays until noon. Bearings, belts, sprocket chains, electric motors. It is a few blocks east of Apex Electronics in Sun Valley. Fry’s Electronics Manhattan Beach (map) – Open 7 days until 9p. We all know the good and the bad about Fry’s. This is the closest one to CrashSpace, but also the smallest Fry’s Electronics store in the chain. Grainger Many Cities (nearest) (brances in the 310) – Usually open 7-5 M-F, though some branches are open on Saturday. Industrial supply. See entry below for online supplies. Grainger has branches all over the place. If the part you want isn’t in stock at the closest branch, there’s a chance it’s at another one within driving distance. Harbor Freight Multiple including Lomita, Woodland Hills, Pasadena – Open seven days. Inexpensive source of cheap tools and miscellaneous doodads. Home Depot – 12975 W Jefferson Blvd, Los Angeles, CA 90066 – The closest Home Depot to CRASH. Open til 11pm every day. House of Hardwood – 2414 Wellesley Ave, Los Angeles, CA 90064 – Woodworking supplies and lots of domestic and exotic lumber. I Love Lucite Culver City (map) – Get laser cutter plastic here. I Love Lucite Los Angeles – Craig Bennet. (310) 966-0740 Craig has provided us material for several projects and close to Crash Space. Industrial Metal Supply Sun Valley (map) – Open Mon-Sat. If you need metal of any size or type they’ve got it. Service is notoriously slow. Expect to be there awhile, even if you’ve phoned in your order. Spend the time poking around their large, fun to see showroom! (pictures) This is the place to buy metal! About $2/lbs of T6061 Aluminum. They also have lead ingot bricks, sheet metal, etc. LaserCuttingShop San Pedro – Laser cutting service. No shop address. Luky’s Hardware Burbank (map) Open Mon-Sat. They are a surplus hardware store with a large selection of nuts and bolts. The isles are packed tight with stuff, so it’s fun to walk around. McMaster-Carr Santa Fe Springs (map) – See entry below for online supplies. If only this were a retail store you could wander through! Alas, it is not, though paging through their notoriously hard to get paper catalog is almost as fun (and using their web site is close to that experience). I’m listing McMaster here because they are somewhat close by, and they offer will-call pick-up at their facility. They also do same day delivery to our area… order it this morning, have it this afternoon! Micro-Etch : 310.217.1385 440 East Rosecrans Avenue These folks do amazing bass and other metal etching work. Pacific Radio Hollywood (map) Burbank (map) – Lots of specialized radio/television electronics. 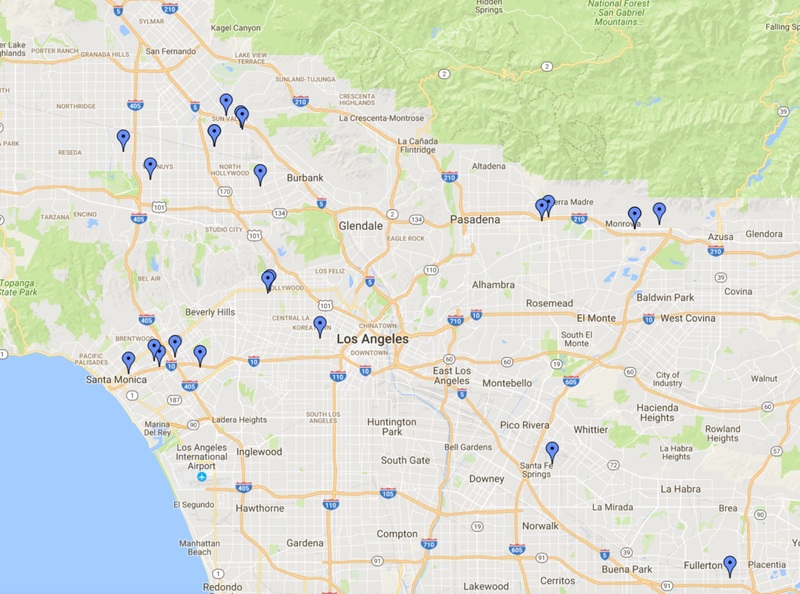 Penpoint Graphics Pasadena (map) – Local shop that can do laser cutting and 3D printing. Plastic Depot Of Burbank Burbank – 2907 San Fernando Blvd. (818) 843-5451 – lots of different plastics. They do laser cutting & milling. They will recycle scrap. Rockler Woodworking – multiple stores in Southern California, including Pasadena, Torrance, and Orange. Lots of tools and wood. Santa Monica Plastics (map) – 2834 Colorado Ave., Unit 39, Santa Monica, CA 90404 – M-F 8am-4:30pm, Sat 9am-3pm. Nice people, very local in Santa Monica off Colorado Ave. Resins, plexiglas, foams, tons of acrylics. They have a shop as well to cut sheets down to size. They are in a small booth off the main street with a lot of other small industrial businesses in an alley, you really need to print out the map to find them the first time. Formerly Hastings Plastics, but they moved. Signal Electronics Torrance (map) – Open Mon-Sat. Small well organized store with knowledgable staff. A bit more expensive. Torrance Electronics Torrance (map) – Open Mon-Sat. Small really chaotic store. Stuff stacked everywhere, but good prices and selection. Ada Fruit Industries – They develop cool pieces of their own, so it’s a small specialized collection. American Science & Surplus – Lots of odd surplus parts and gear. Cool Neon – Supplies for EL wire. Benny is a good guy. Goldmine Electronics – Surplus electronics and cheap grab bags of parts. Grainger – Industrial supply. Almost (but not) as good as McMaster-Carr. McMaster-Carr – Industrial Supply. You can find almost anything here. The web site works really well. Small Parts – All the specialized little pieces you might ever need. SparkFun Electronics – A company dedicated to hacker electronics with an ever growing selection. Jameco – Parts & Componets. Really good integration of paper and web-based catalog. Easy to find stuff. DigiKey – Parts & Components The have everything but their site is hard to use unless you know EXACTLY what you are looking for. Mouser Electronics – Another one of the biggies. (i.e. D-Subminiature Connectors (19,525) ) that are better when you know what you want. Ponoko – They are a laser cutting service with a variety of materials. Protocase – They build metal cases and do small runs, and were helpful with a project I was working on. Shapeways – 3D printing on demand with a variety of materials that can do fine detail work. Electronics City Burbank (map) – Small shop in Burbank with a good supply of enclosures (pictures). Closed after Christmas 2013, web site also defunct. Opamp Technical Books Hollywood (map) – For those hard to find technical specialty books (pictures). The book store will close as of 28 February 2014. Its web site does not have an up-to-date list of its stock and lists incorrect store hours. They are open Mon-Fri 8 am to 5:30 pm; closed on Saturdays.